This sweater is for my cousin Dennis, and I promised it last Christmas, and am shooting to complete it by his birthday in late November. 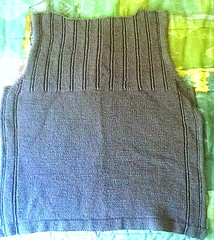 I’m using the template for a back pullover with set-in sleeves from Sweater 101 by Cheryl Brunette. 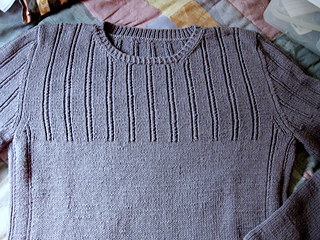 So far, I’ve swatches in a coulple of stitch patterns and gotten input from Dennis on style, fit (I measured some of his sweaters), color and texture. 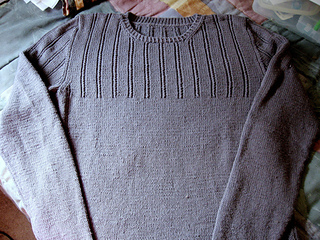 9/6/02012 - Finished the back of the sweater and washed and dryed it (the way it will be cared for). Measurements are coming out just right - thank goodness I made a swatch, measured it, and washed and measured it to account for shrinkage. 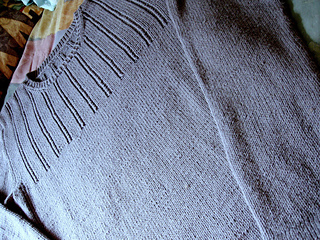 9/29/2012 - front is knitted up to necklines opening now I have to do some math. 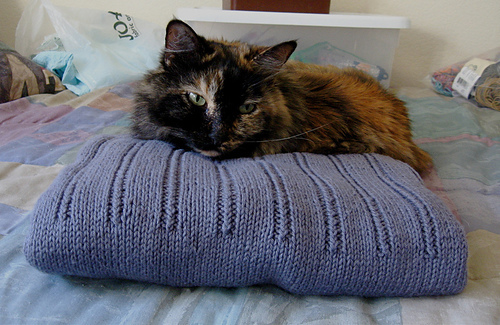 I’m loving the fabric that this yarn makes - may make another sweater in this! 9/30/2012 - the front is done. 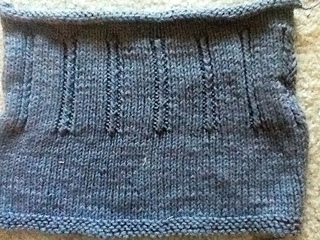 I had to rip out a few rows when I got the final stitch count wrong at the shoulders, but it was a fast reknit. Now I’m onto the sleeves -- I’m doing them 2-at-a-time flat (this is cotton-linen that I’m dealing with - seams count) and I hope that they’ll go quickly. 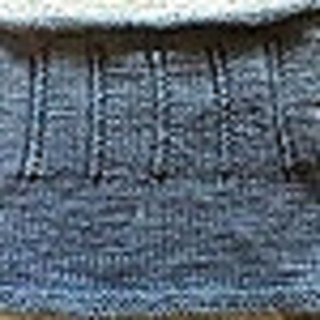 I think the bottom part of the sleeves will be stockinette, then I’ll switch to the ribbing pattern from the armhole up. 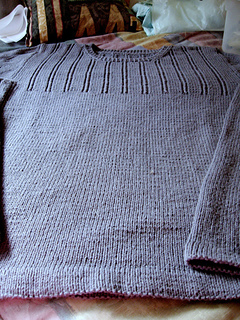 10/19/2012 finished the sleeves up to the armholes early in the month. Now I need to do some math for the sleeve caps! 11/10/2012 - argh. I should have calculated how many increases to do on the sleeves. Anyway, I had to rip out 7 inches on each of the sleeves because they got too wide too fast. Hopefully we’re on track, and I do have the math calc’s for the sleeve caps. Now it may be a slog, but I can do it! 11/25/2012 - had another bad moment, but I was trying to knit the sleeve caps in the ER with my Mom, so I guess it’s a bit understandable. 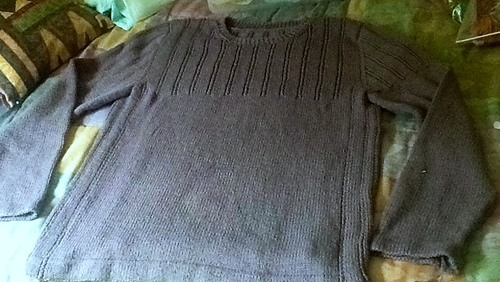 Have now finished the sleeves, sewn the sweater together. All that remains is the neckline,weaving in ends, and a final blocking! 11/27/2012 - Decided to do a 1x1 twisting ribbing for the neckline on Size 2 needles, along with a bit of short rows to have the back neck a bit higher. I did a tubular bind-off to make it lovely. 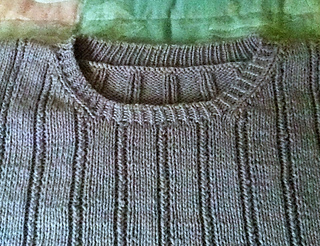 I’m liking it, now’s the time for blocking to see how the whole sweater turns out! At last, at last! 12/3/2012 - Finally and completely done. Will have to wait a bit to see if the fit is on - praying hard for that to be true!